Sainted Andrew, Archbishop of Crete, was born in the city of Damascus into a pious Christian family. Up until seven years of age the boy was mute and did not talk. However, after communing the Holy Mysteries of Christ he found the gift of speech and began to speak. And from that time the lad began earnestly to study Holy Scripture and the discipline of theology. At fourteen years of age he went off to Jerusalem and there he accepted monastic tonsure at the monastery of Saint Sava the Sanctified. Saint Andrew led a strict and chaste life, he was meek and abstinent, such that all were amazed at his virtue and reasoning of mind. As a man of talent and known for his virtuous life, over the passage of time he came to be numbered amongst the Jerusalem clergy and was appointed a secretary for the Patriarchate – a writing clerk. In the year 680 the locum tenens of the Jerusalem Patriarchate, Theodore, included archdeacon Andrew amongst the representatives of the Holy City sent to the Sixth OEcumenical Council, and here the saint contended against heretical teachings, relying upon his profound knowledge of Orthodox doctrine. Shortly after the Council he was summoned back to Constantinople from Jerusalem and he was appointed archdeacon at the church of Saint Sophia, the Wisdom of God. During the reign of the emperor Justinian II (685-695) Saint Andrew was ordained bishop of the city of Gortineia on the island of Crete. In his new position he shone forth as a true luminary of the Church, a great hierarch – a theologian, teacher and hymnographer. Saint Andrew wrote many a Divine-service song. He was the originator of a new liturgical form – the canon. Of the canons composed by him the best known is the Great Penitential Canon, including within its 9 odes the 250 troparia recited during the Great Lent. In the First Week of Lent at the service of Compline it is read in portions (thus called "methymony" [trans. note: from the useage in the service of Compline of the "God is with us", in Slavonic the "S'nami Bog", or in Greek "Meth' Humon ho Theos", from which derives "methymony"], and again on Thursday of the Fifth Week at the All-night Vigil during Matins. 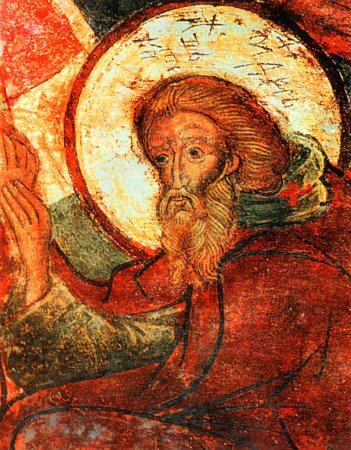 Saint Andrew of Crete gained reknown with his many praises of the All-Pure Virgin Mary. To him are likewise ascribed: the Canon for the feast of the Nativity of Christ, three odes for the Compline-service of Palm Sunday and also in the first four days of Holy Passion Week, as well as verses for the feast of the Meeting of the Lord, and many another church-song. His hynographic tradition was continued by the churchly great melodists of following ages: Saints John of Damascus, Cosma of Maium, Joseph the Melodist, Theophan the Written-upon. There have also been preserved edifying Sermons of Saint Andrew for certain of the Church feasts. Church historians are not of the same opinion as to the date of death of the saint. One suggests the year 712, while others – the year 726. He died on the island of Mytilene, while returning to Crete from Constantinople, where he had been on churchly business. His relics were transferred to Constantinople. In the year 1350 the pious Russian pilgrim Stefan Novgorodets saw the relics at the Constantinople monastery named for Saint Andrew of Crete.